What are we to do with ruins? Visiting Athens, as I have been doing, you see a city defined by its ruined past. 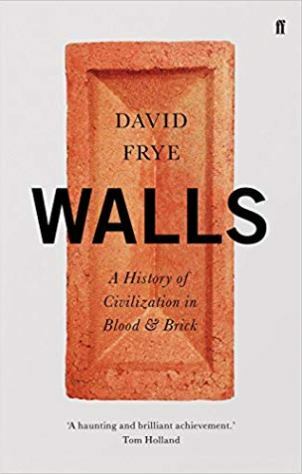 Everywhere, or in the centre at least, a modern city and the surviving traces of its existence two or three millennia ago, each define the other. The ruins of temples, market places, meeting houses, podiums, houses, shops, baths and gates, appear throughout the city, sometimes prominently – as with the Acropolis, the Ancient Agora or the Temple of Olympian Zeus – but also seen through gaps in the shopping areas or down side streets, where another archaeological investigation is underway. The modern city must weave its way around its historical inheritance. Yet at the same time modern Athens defines its ruins. The modern city acts as a reference point, telling we who have come primarily to see Ancient Greece how those ruins were once filled with life and purpose. We look to the ruins in the hope of rediscovering the lives that animated them, where people like us met, shopped, argued, fought and tried to understand it all. We measure ourselves, whether tourists or residents, by those doorways, those walls. We stroll again through colonnades, look up at statues designed to look down upon us, judge the length of walks, the distances between landmarks, the space the rooms provide for us. This is what gives ruins their poetry – we sense the loss through time, but also that our faint presence is essential to their being. In our imagination, Greece rises again. The ruins are in differing states of condition. 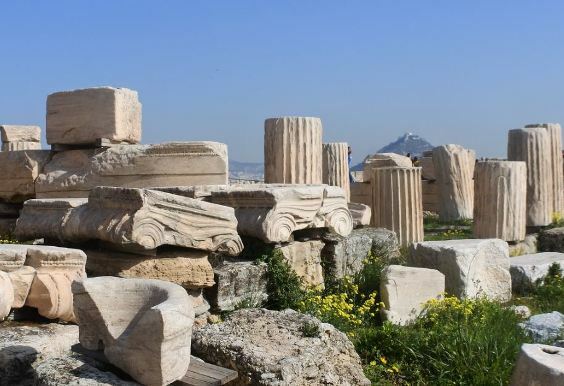 It is a wonder, given the repeated assaults and sackings (by the Persians, Romans, Herulians, Visigoths, Slavs, Turks, Venetians and – worst of all as one explanatory board on the Acropolis informed me – Lord Elgin), that any of it survives at all. What was not torn down was often re-used for other building works, worn down by the weather, or simply fell apart through age. 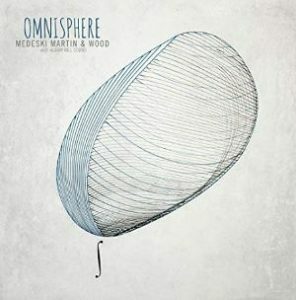 That which was organic (wood, cloth) disappeared long ago in any case. Stone remains. Not all of it fits together. Time was when the first archaeologists and heritage enthusiasts attempted to rebuild that which had fallen into ruin, using whatever materials lay to hand. Such clumsy, often damaging work, has now been undone by wiser heads, and in each of the major archaeological sites you see piles of stones, arranged neatly on the ground or stored on shelves, pieces of a puzzle that must await their time until the archaeologist identifies their true purpose and place. A ruin is romantic, a powerful spur to the imagination, but what would we think if the building had survived intact? I saw two striking examples in Athens, albeit recreations rather than survivals. 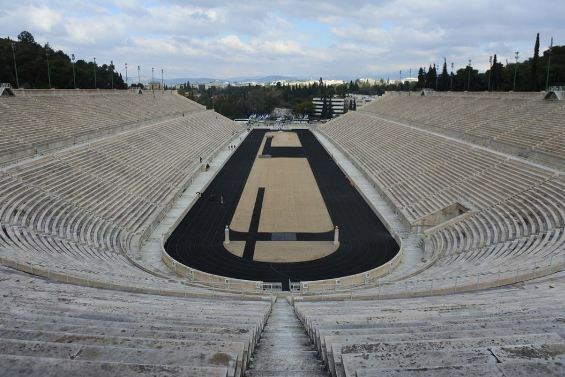 One is the marvellous Panathenaic stadium, home to the 1896 Olympic Games, the first such Games of the modern era. The original stadium was built in the 4th century BC, then significantly re-shaped in Roman times in the second century AD. By the 19th century all had been worn away and buried, the marble long since taken for the construction of other buildings. Excavation revealed the outline, and then thanks to funding from businessman George Averoff, and working to plans by architect Anastasios Metaxas, a near-simulacrum of the Roman stadium was recreated, with only some small concessions to the needs of modern athletics (a slightly wider track, and one that was laid with cinders). The result was, and remains, a triumph of historical sympathy. It looks like it has survived, miraculously intact, since AD 144. It is authentic as it could be, needing only the crowd and the games themselves, to collapse the time difference (the venue is occasionally used for events and hosted the finale of the Marathon in 2004). 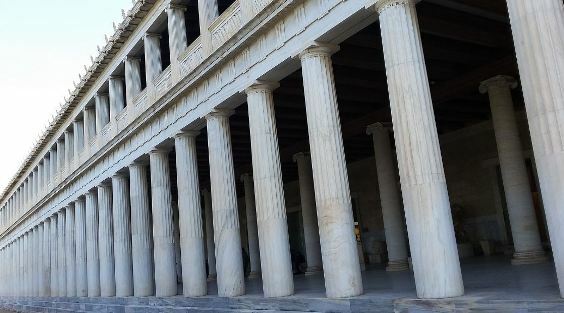 Just as powerful is the Stoa of Attalos in the Ancient Agora, the administrative, social and commercial centre of Ancient Athens. 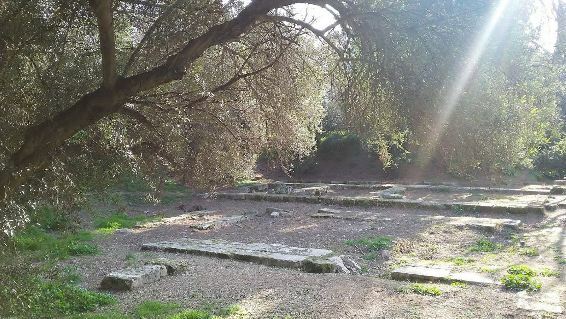 Ancient Agora itself is a model of how to present a set of ruins, with trees planted in the 1950s (attracting flora and fauna) having turned the area into the most pleasant sort of park, nature artfully offsetting stone, encouraging contemplation. The Stoa, a long double-colonnaded building (155 metres) that served as a viewing platform for processions but also housed a shopping arcade, was built in the second century BC. What exists now is a reconstruction, built by American and Greek architects in the 1950s, with funding from the Rockerfellers. One is so used, in Athens, to see incomplete pillared buildings – the Parthenon most notably. The Stoa of Attalos has every pillar in place, the buildings that lay within intact (you weren’t supposed to be able to see through the Parthenon), the floor surface immaculate. You perambulate through the columns just as they once did. Unlike the Panathenaic stadium it does not persuade you that it is a miraculous survivor. It looks too immaculate, too much the romantic’s dream (the original building would have had a red and blue frontage – what has been re-created is pure white, in line with present-day expectations). But it has a practical purpose, showing us how the space functioned, serving as a measure for all the other incomplete stoas and temples. We see something of how things would have been. (I should note that Ancient Agora includes the Temple of Hephaistos, which though smaller that the Stoa of Attalos, is in a near original state, with all of its columns in place). So what if everything had survived, or could be reconstructed in this way? What if the whole of the Ancient Agora were to appear as it has been, representing some optimum time? 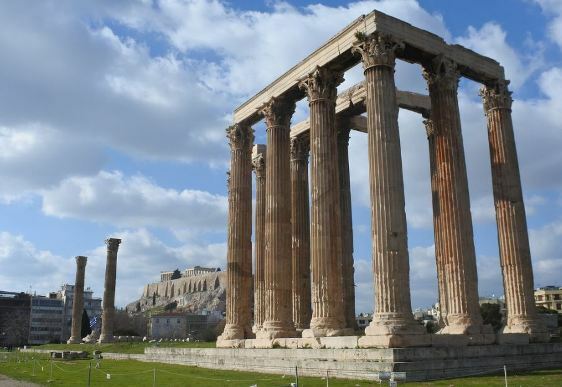 (the Periclean golden age of the 5th century BC would be the inevitable choice – no one seems to be pressing to remember the Parthenon as a mosque, which was the case for a few hundred years) How would we treat such impossible defiance of time? It would be like a toytown world, only full size, or a movie set with no boarding for where the cameras are not going to go. It would be unreal. We could not treat it as history – all we could do would be to live in it. Or sack it. We need ruins to mark the passing of time, and our place in it. The presumption is that we are made aware of the significance of the ruin laid before us. There is a terrible poignancy about the ruin whose meaning is lost: the function of the place, the inhabitants, its dates. It had importance once, recognised by all those that it which to impress, yet it must have hoped to cast its shadow over the future as well, but time and erosion have done for such hopes. Even Ozymandis had a name, and so left us with a lesson. But a stone we no longer understand offers no measure, and so we pass it by. But what of the neglected ruin that has much to say? Hidden away in an undistinguished residential north-west corner of Athens, far from the tourist haunts or main thoroughfares, there is a somewhat shabby park mostly frequented by dog walkers. In a few places the land dips to tree-fringed hollows. There, in one such grove, are the geometric outlines of a long-abandoned building, marking out what were rooms, what were spaces, but are now merely ruins. At the far end a sign board informs us that here was the Gymnasium, the main building of Plato’s Academy, the very home of Western thought. Accident has led this most significant of historic sites to be virtually abandoned, while others flourish. Established around 387 BC (the Romans destroyed it in 86BC), the Academy was firmly on the map in its day. It was situated at the end of a prominent road that led from the Dipylon Gate, the entrance to Athens, the ruins of which can be found in the Kerameikos area, in the shadow of the Acropolis. 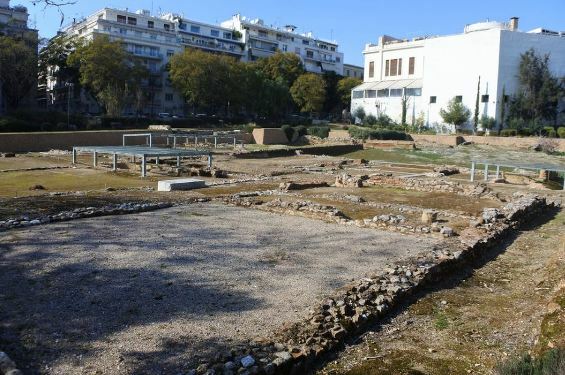 But residential Athens has built up thickly about the area over the past century, and by the time excavations began on the location, in 1929, the site was effectively cut off from the centre of Athens and its core archaeological sites. Plato’s Academy was the great institute of higher learning of its time. Here students studied philosophy, in its broadest sense – mathematics, astronomy and physics may have been a part of it, though rather than a curriculum as such it was more about encouraging investigation in all things through observation and dialectical discussion. It occupied around 3.5 acres, with the central building being the rectangular Gymnasium. There was a library, teaching rooms, and a colonnaded atrium. It was a scientific engine for research into what we are, the model for every university, institute and academy that has followed. It was the physical expression of Plato’s thought, the greatest figure in Western philosophy. Plato’s forgotten Academy site is likewise a place for contemplation, if you can find it (few tourists do), but of a different kind. Its message is one of loss, of time’s harsh disrespect for human things. Of course, the real Plato’s Academy was and is a thing of the mind, and in that form it has flourished like no stone buildings could ever do, enriching every corner of human enquiry and discovery from ancient times to our times. But some greater respect for the stones would not go amiss. Alas, Greece is a country that has hit hard times, and the site itself is awkwardly located. 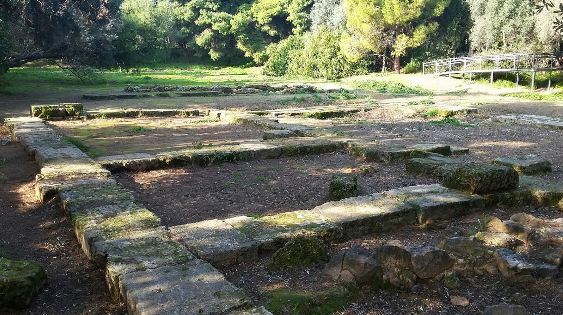 In other circumstances, the money would appear to found a university on the site (the Agricultural University of Athens is not far away), with transport links to match. Who would not want to journey to Athens and study at the Academy? These are dreams. What remains of the Academy in reality is the outlines of walls, with some tumbledown tombs nearby, the vestiges of a Roman building in an adjoining hollow, and other fragments dotted across the park, some now painted with graffiti. Its message is one of loss and failure, too much connected with a society which has suffered lately from ruin of an economic kind. 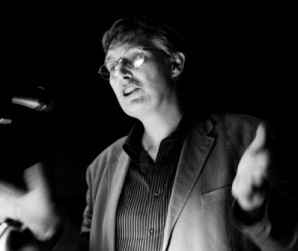 At the heart of the failure is the need for that connection with us, with the city of today. It needs our imagination to recover its meaning, but that will never be realised while the site is, put simply, so hard to find and so lacking in observable greatness. It needs a dialectic between present and past, as Plato of all people would advocate. The past is ourselves, and every ruin must remind us that this is so. I’ve never been to Greece but having just looked through your wonderful album on Flickr I feel almost as if I have.